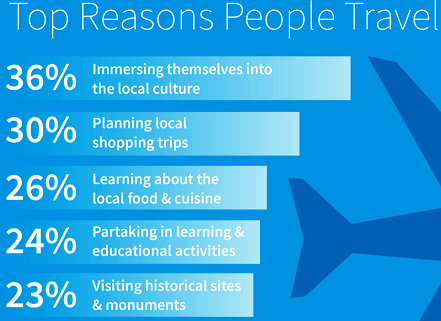 Home Travel & Tourism Why Do People Travel ? Travelling is one of the common passions of most people. People travel to get pleasure or to take break from their daily busy schedule. Travelling helps people to refresh their mind and health as well. Even some researches state that travelling also help the consumers to associate with the success and accomplishment. Comparing to past years the number of travelers have markedly increased and these increasing number of travelers will leave a significant impact on tourism and flourish the tourist’s attractions among the adventure seeker. Longer Life Span: The life expectancy of people has increased which foster them to enjoy their leisure time more. Flexible working hours: Flexible working schedule and longer weekends (ex- 10 hours in a day) in any job sector especially in the hospitality and tourism industries inspire the service holder to get free time from their schedule to travel. Early retirement: In recent years, people are being given the opportunity to retire at age 55. The early retirement allow them enough time to travel in their retired period. Greater use of travel: Today it become more convenient to travel on holidays and weekends due to easy mode of travel which ensure hassle free travel with less travelling time. Tendency to take shorter, more frequent trips: Now people are more smart and intelligent which lead them to take shorter but more frequent rip, mini vacations since it is more economical and convenient rather than long tours. Generally European take much longer vacations than North Americans. Increase in the standard of living: Increased amount of income of middle class people in the developing countries has increased their standard of livings which lead them to enjoy life more than previous time and except travelling what could be better option. Expansion of Tourism: Ecotourism, sustainable tourism and heritage tourism are bringing light on to the tourist attraction which increase the need for tourism among the travelers. Increased Promotional Activities: Government has taken implementation for raising the importance of tourism not only as an economic force, but also as social cultural forces of increasing significance, hence the people are also becoming updated about the particulars of tourism. The private sector also implement the promotion and development of tourism to attract tourist. Advancement of technology: Availability of information through internet related to tourism, travel, name of the tourists attractions to visit, name of archeological sites, gaming opportunities, shopping facilities. Now travelers also can book their trips via Airline’s websites which save their time and money both. If countries come with more bilateral signing with each other than people of those countries may easily get visa and visit each other countries comfortably. Increased number of travel agencies and home based travel agents. Nowadays people don’t need to wait for printed air ticket. Purchasing ticket from online or through mobile phone is easy and e-ticket is enough to travel anywhere in most of the cases. Employment of Automatic airport check-ins. Increased concern for the health and safety of travel and tourism for travelers inspire them more to travel.